Imagine a moment when negative emotions overwhelm you. Do you dig deeper to understand it? Or do you distract yourself to push them away? If you answered yes to the latter question, you may want to reconsider. Emotions are the gateway to our needs. Satisfied needs reveal positive emotions. While the opposite holds true. Negative emotions are the product of needs not addressed. With an intention to grow emotionally, I was fortunate to come across a fascinating book co-authored by Margaret Moore (CEO Wellcoaches), Organize Your Emotions, Optimize Your Life: Decode Your Emotional DNA-and Thrive . In the book, it identified the steps to decode one’s feelings as well as its connection to one’s needs. With emotions unraveled, we enrich our lives, therefore effectively optimizing our health and well-being. Within us, a push and pull exists among these sub-personalities. When one becomes more dominant than the rest, an inner battle of sorts is likely to happen. Hence, understanding your emotions can help to discern which needs require attention. 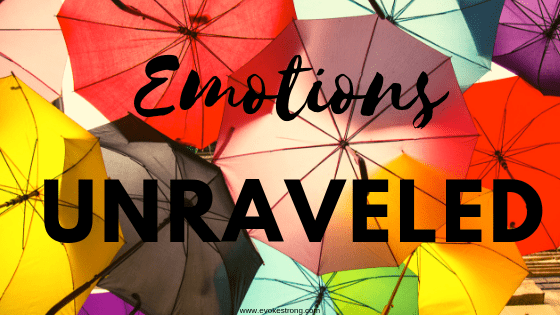 I used these six steps to decode a particular emotion I recently experienced. In the exercise, I discovered mindfulness is the encompassing theme to unravel one’s emotions. In fact, it is the initial step! To be aware and know exactly the specific emotion you’re experiencing. In my situation, I identified the emotion as frustration. When I feel frustrated, I tend to have less patience and raise my voice towards my kids when they misbehave or have a hard time listening. Afterwards, it leads to regret. The second step might sound easy, but a practice I’ve mastered to avoid during my younger years. It’s to accept the emotion as it is. In the past, I turned towards distractions to mask negative emotions. The avoidance only exacerbated the burgeoning pain which one day came crashing down on me. Therefore, it’s important to accept our feelings as they open the window to our needs. Don’t try to push back against these emotions. Accept that they are here, that they are trying to communicate something to you, and understand that you are about to take steps to act on that information. In accepting frustration, I simply admit the feeling. No denial or pushing it aside. Welcoming the feeling of frustration instead of running away from it was a liberating experience. Step three was a difficult thing to do – to appreciate the negative emotion. Being grateful for an emotion that doesn’t make me feel good was a hard concept to grasp. Take a moment to appreciate the emotion. It’s helping you, it’s guiding you, it’s pushing you, and it’s telling you what you need. After reading the reasons behind this approach, I understood how this could lead me to better understanding the way I felt. Viewing frustration as a guide to help me discover unsatisfied needs allowed me to pause instead of becoming overwhelmed and reacting to situations in an unreasonable manner. Have you ever felt as if you’re the only person in the world experiencing difficult emotions? I admit I have. I’ve experienced feelings of isolation as if everyone was conspiring against me. The fourth step made me realized all human beings go through moments of despair. ...when you cry, you are not crying alone. You are not unhappy alone. Everyone has negative emotions, some worse than others, yes…It’s a reminder that you are not an isolated hole of despair in a universe filled with twinkling stars. Everyone has these emotions; it’s a function of being human. This idea of connection is drawn from Dr. Kristin Neff’s definition of self-compassion. Self-compassion is comprised of three components: mindfulness, self-kindness, and common humanity. With this perspective, I’m able to handle my emotions with more compassion. It helped me to understand how we all experience feelings of frustration and that I can work through them. The following step is the most important which is compassion. I loved the metaphor used in the book comparing negative emotions to crying babies. Babies cry when they crave attention and hugs for comfort. Our feelings cry out as well and we need to be compassionate towards our negative emotions. …simply crossing your hands over your heart or giving yourself a little mental hug, a pat on the back, or a high five can help…Having a little heart toward your own heart softens the sting of these negative emotions. Unfortunately, when it comes to my own suffering, instead of compassion, I am judgmental. I tell myself I shouldn’t feel this way. However when I tried placing a hand over my heart and saying “I got you”, it gave me a sense of calmness and comfort. Finally, the last step is to be curious, to dig deeper. Remember the nine sub-personalities I addressed in the beginning? It’s time to figure out which one is being silenced. What’s causing my frustration? My dominant sub-personalities, The Executive Manager and The Standard Setter weren’t satisfied. One source of frustration was the amount of work around the house I’ve neglected to do, namely the overwhelming items I need to clean out of the garage. The Executive Manager wants to be better organized and the Standard Setter needs to have this done already. I was able to satisfy both by scheduling small periods of time to slowly weed out the items I no longer needed. This brought more satisfaction to the two sub-personalities, hence less frustration! How do you deal with your emotions? Do you connect your emotions with your needs? Have you read the book, Organize your Emotions? Reference: Moore, M., Phillips, E., & Hanc, J. (2016). Organize your emotions: Optimize your life. New York, NY: HarpersCollins Publishers. I can always use a little help deciphering my emotions. This sounds like a fascinating and helpful read! Thank you for sharing. You’re welcome! I did find it fascinating. I’m an emotional eater (which I’m trying to change) so I’m constantly trying to sort of my feelings to get to the root of the issue. That way i can take steps to change it! Good to hear you’re taking action to discover the root of it. I feel like I’m in tune with my emotions. I try to deal with them as they come up and talk it out, meditate, use positive mantras. It’s wonderful to hear you’re tuned in to your emotions. I like to meditate as well and recently started on affirmations. Always looking for good book recommendations, especially those about mindset/psychology. Will def check it out. Thanks Chris – hope you find it interesting as I did. I agree. Sometimes it can be overwhelming that it’s key to be aware of what it truly is telling us. Such a great post! So many people can benefit from this. I try really hard to recognize what I’m feeling and not to take those feelings out on other people. Running really helps me process a lot of those feelings and I really think it’s because there is more blood flow to the brain while exercising and it helps things seem more reasonable when that’s happening. Thanks Jenny. I’ve found myself placing the blame on others instead of understanding what it is I really need. How interesting. Thanks for posting. Our emotions influence all our actions and sometimes not in a good way. I have a lot of anxiety issues, so I’m probably one who overanalyzes my emotions. Sometimes, I can figure them out, and sometimes they are absolutely illogical and unreasonable and I just have to wait for them to pass. It’s annoying but i do my best to roll with it. Hi Jenn, I understand that you see some emotions as unreasonable but in actuality, they may be cluing you in on a need that you are wanting to fulfill. I am fascinated how feelings can be connected to needs when we pay attention to them. I love this! Definitely going to check out the book! I like step 3 – take a moment to appreciate the feeling. I usually just brush off feelings – but I’m going to follow through with slowing down and appreciating the moments I’m in. What a wonderful reference to help us understand and deal with our emotions!! I have not read this book, but I have read some by Dr Henry Cloud on emotions and boundaries. Soooo good. Sometimes it is hard to confront emotions or deal with them. I have been worried about a lot of stuff lately and there really isn’t something I can do about it. We have some big expenses coming up and there is no way around it and no solution, so I have to figure out how to manage those emotions. This looks really good. We’ve moved a lot recently and had several family members pass away as well. It’s been difficult to sort out all the emotions. It seems like the ideas in this book could help. Thanks for the review!